Resurrected GSR to be showcased at Chicago Auto Show alongside R-Line Beetle Convertible and two limited edition GTI models. 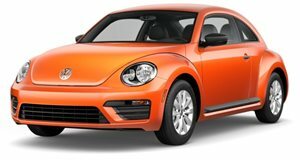 Volkswagen is bringing a pair of new Beetles for 2014 and a couple of limited edition GTIs that will be available almost immediately to this week&apos;s Chicago Auto Show. The standout model of the quartet is the Beetle GSR - short for "Gelb Schwarzer Renner" or "Yellow Black Racer" - a tag that was attached to a sport-tuned Beetle in 1972. Only 3,500 were built exclusively for the German market, and all were sold within two months. Like the original, VW is limiting the 2014 model to 3,500 units, but will be selling them worldwide. When it goes on sale later in the year the 2014 GSR will be the most potent Beetle in the lineup. Power comes from VW&apos;s 2.0-liter turbo four-cylinder boosted to 210 horsepower and 207 pound-feet of torque, which will enable the Beetle GSR to go from 0-60 mph in 6.6 seconds en route to a top speed of 130 mph. The new Beetle GSR sports a new twist on the 1970&apos;s model yellow-and-black livery. Where the original had a matte black hood, boot lid, and bumpers with black/yellow side stripes above the door sills, the new model has gained a black roof and side-mirror surrounds, yellow painted bumpers, and a yellow/black rear spoiler. Black/yellow stripes with "GSR" lettering above the side sills and black-painted 19-inch "Tornado" alloys complete the modern interpretation of the 70&apos;s classic. However, if the shocking colors are too much, then VW also offers the Beetle GSR in Platinum Grey and Black. The bumble bee coloration continues inside, with black leather and contrasting yellow stitching trim on the seats, handbrake lever and steering wheel that comes complete with a badge marked with a special-edition number (1 to 3500). Orders for the Beetle GSR can be made from May, priced at 30,300 Euros in Germany. The other Beetle bound for Geneva is the Beetle Convertible with R-Line package, which from a functional perspective is identical to the Convertible Turbo, but comes with 19-inch alloys, LED DRL&apos;s, Bi-Xenon headlamps and R-Line badging inside and out. The limited edition GTIs include a Driver&apos;s Edition - limited to 3,000 units - that comes with 18-inch alloys, a golf ball shifter knob for the six-speed manual and the normal GTI&apos;s sunroof and navigation packages. Finally, VW will roll out the $25,095 Wolfsburg Edition GTI, which mimics the $29,695 Driver&apos;s Edition sans the sunroof and navigation.